Here’s an interesting skincare entry to start our tropical summer right! The surging temperature has been bothering me recently, aggravated by the killer El Niño phenomenon. Now, I’m missing the cool, refreshing months brought by the holiday season, as I’m painstakingly bracing the crazy heat both indoors and outdoors—not to mention, I’m amid doing yoga which requires me to stay in a heated room for about a couple of hours! The sudden temperature change is taking quite a toll on my skin. I’ve been experiencing breakouts especially on my chest and back since the heat starts rolling in. Now, even my face is kind of breaking out, which is something that I really, really don’t want to happen ever again! This provokes me to grab a tried-and-tested acne regimen to answer my zit woes. 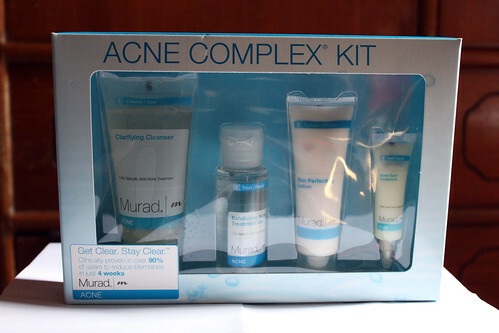 Murad Acne Complex Kit has been proven by some friends of mine that it really works. Well, it could have worked on those who mainly have mild to moderate acne. So, I did not hesitate to grab a starter kit in pronto and give it a try, hoping that this will be perfect for my current skin condition. Moreover, it claims to clear skin in just 4 weeks—guaranteed! Murad Clarifying Cleanser is an antibacterial gel cleanser that promises to kill 99.9% of surface bacteria without causing skin irritation. Murad Exfoliating Acne Treatment Gel is a gel-like serum that helps heal existing blemishes whilst preventing new ones from forming. It penetrates deep down into the pores, and eliminates skin cell-buildup. Murad Skin Perfecting Lotion is an oil-free moisturizer that keeps your skin well hydrated, as well as calms skin’s redness and irritation sans clogging your pores. Plus, I also got Murad Acne Spot Treatment that stops a zit from brewing like crazy, while reducing redness and irritation. Unfortunately, I didn’t get the Clarifying Mask, though you may get one should you order directly from their website. I’ve been religiously using the complete set for three days in a row. So far, I haven’t noticed any adverse reactions, such as purging, caused by these products. I’m happy, on the other hand, as my skin momentarily stops breaking out even more! I still got around 27 days left, so let’s see how it is going to perform after a month! How much the kit? Thanks. Hi! 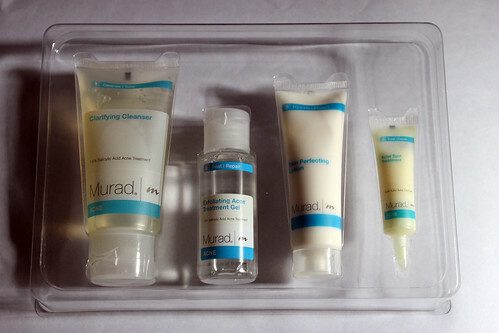 Please help where I can purchase the Murad Acne Complexion kit locally. Im leaving in laguna I hope you can recommend a nearby store. Great kit! This weather has also been taking a toll on my skin. I am now breaking out in places (like on my forehead) where I never used to break out before. I think I am gonna try this kit! Thanks for posting this! I’m really struggling with spots and have tried many face washes. I seen on another website about using lemon juice as an acne treatment. Is this true? would lemon juice work or should I just buy this Acne complex kit? Im unsure on what to do from here, any help would be appreciated.